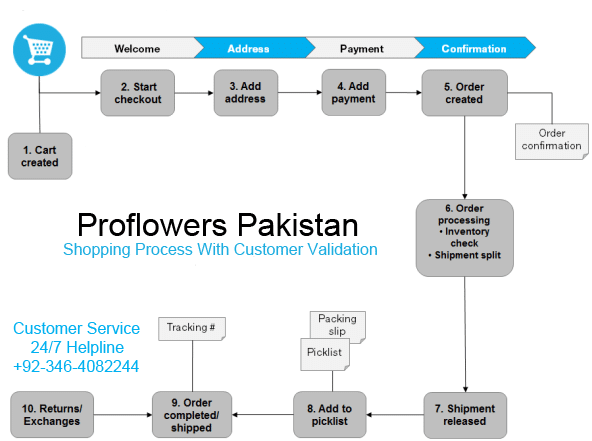 In the following we will describe an example of a Proflowers.pk B2C type of shopping workflow and the actions and tasks involved. In this example, a customer does not need to register on the site in order to buy. The order process actually starts as soon as the visitor selects a product and adds it to a shopping cart. A cart (basket) will be created and saved in the system, and can be viewed in Orders under “Carts”. If the customer does not complete the checkout procedure, the cart will remain in the system for a specified time. When the customer returns to the website, the cart will be “remembered” and made available for continued shopping. Already in this early step the system will perform an inventory andpricing check, to look for availability in the warehouse, as well as discounts for selected products in the cart. This will be updated if and when the customer returns to the cart at a later stage. When the customer decides to complete the purchase and chose to “proceed to checkout”, the first step of the checkout procedure is initiated. In the second step of the checkout procedure, the shipping and billing address information is added together with the preferred type of delivery (First class/Express etc). The address information can be entered manually by an “anonymous” customer, or automatically if the customer is logged in and has a registered user profile with address information. The system can also be set up so that it is possible to split shipments in different parts and to different addresses here. In step three of the checkout procedure, the payment is added to the “purchase order to be”. The system will calculate the total sum including the purchase amount and the shipping fee. In this step the customer selects a payment method, for instance by credit card or PayPal. The payment will be registered and verified. This may happen instantly or after a certain specified time, depending on how the payment process is set up and the type of e-commerce solution (B2C or B2B). In this step it is also possible to split payments, if the system is configured for this. Usually the actual purchase order is created in the system when the payment is settled. In the last checkout step, a purchase order number is created, the customer confirms the purchase, and an order confirmation is sent to the customer. The shopping cart is now converted to a purchase order which is visible with status “In Progress” under “Purchase Orders” in Orders. When the order is created the order processing starts. This consists of steps to check the warehouse and inventory status for the products in the order, and for creating the actual shipment. Depending on the inventory status for the products, the order may be split into more than one shipment. Shipment Released – when the shipment is verified, it will be released. The purchase order will now appear in Orders, under “Shipping/Receiving” and “Released for Shipping”. This steps involves the addition of the shipping items to a picklist. The picklist is the list that the warehouse will use to create the physical shipping of the products in the order. This step will also produce a packing slip, which is the paper slip that will be attached to the physical package to be shipped. When the picklists with the different orders and their respective packing slips have been created, the order will be set to completed. In the system this involves the creation of a shipment validation number which is associated with tracking number. The tracking number can be entered manually or automatically, if such an integration exists. The tracking number connects the physical package with the shipping provider for the delivery, and is used for tracking the package on its way to the delivery address. The purchase order will now appear in Orders under “Purchase Orders” again, with status “Completed”. Only completed orders can be subject to returns/exchanges. Depending on how the system is set up, returns can be created automatically or manually. Creating a return usually involves replacing a delivered product with another one in exchange, and/or a payment refund. When the return is created it will appear in Orders under “Shipping/Receiving” and “Returns”. Order status can be for instance “Awaiting Exchange”. If the return involves replacement of a new product, the shipping procedure will be initiated again. The return may also involve receiving a faulty product, in which case a receiving procedure is initiated involving the acknowledgement of a receiving receipt for the returned product. ERP (Enterprise Resource Planning) – central system for managing pricing, warehouses/inventories, customers and similar. Payment gateways – the setup of different payment solutions for instance credit cards and PayPal. Shipping gateways – the management of shipping providers and exchange of tracking information. Inventory/warehouse system – exchange of inventory information in connected warehouses. Customer services – exchange of for instance order status information.